Hi, I am interested in your 2009 Dodge Challenger (stock #3972-CHA) listed on Autotrader for $27,995. I'd like to get more information about this vehicle and confirm its availability. 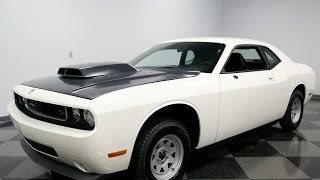 This 2009 Dodge Challenger Drag Pak presents a unique opportunity to purchase not only very rare and exclusive Mopar sheetmetal, but one that is untouched and as delivered from the factory. So if youre looking for that next piece to preserve in your collection, or start your own NHRA/IHRA Super Stock program, now is your chance! Dodge built 100 of these cars solely for sanctioned racing as a package car for stock and super stock series, and this particular car is number 83 built for the 2009 model year. Buyers were provided with a motor and race-prepped, non-street legal shell, but the rest is up to the buyer for completion. Therefore, most of these Drag Pak cars have gone on to see the intended use they were built for, making 1/4 mile passes, so finding a car with this kind of pedigree that is still as the factory delivered in a body-in-white finish is certainly rare. A Drag Pak exclusive, composite liftoff hood, is the only update to the body of the Drag Pak cars, everything else is OEM Challenger finished in Stone White. These cars were never issued a VIN, so you wont be able to legally take this Challenger on the road without it. With that in mind, Dodge provided the customer with a mirror delete for some extra weight savings. Youll also notice the steel trailer wheels, these are for transport purposes only since the customer will be supplying their own competition wheels and tires. The windshields have been spot glued in four places for easy removal when its time to install a roll cage, and there is a small pull latch in the rear fascia to access the trunk since the Drag Paks are devoid of unnecessary power accessories. Inside, things still resemble a street going Challenger. There are some obvious features missing for more weight savings like the center console, power controls on the steering wheel, the rear seat, and sound deadening material. In fact, The Drag Pak weighs about 1000 lbs less than a regular Challenger and also comes without a windshield wiper assembly, no power steering system, no heat shields, no fuel tank assembly, no exhaust system, and even the door windows are lightweight polycarbonate pieces. There is only half of the carpet provided and the only obvious additions over a stock Challenger are the Viper seats to accommodate a 6-point harness and a Mopar switch panel located in the center of the factory dash. Even though the HVAC system has been removed, the factory controls still rest in the dash. Probably a good spot to mount a few auxiliary gauges if this Drag Pak ever sees the drag strip. Drag Pak buyers had the options of a 5.7L or 6.1L Hemi, or a 5.9L Magnum motor. Car number 83 comes with the most powerful option, the 6.1L Hemi motor braced by solid motor mounts, and it looks great topped by an aluminum high ram EFI intake manifold with a four barrel throttle body. Inside the orange, cast iron block is a forged reciprocating assembly with forged 12:1 pistons and a hydraulic roller cam. Confirming the authenticity of this rare car is a LC22 Drag Progarm identification plate with a serial number mounted by the passenger side strut mount. Drag Pak buyers had the option of a set-up for a 4-speed automatic or 6-speed manual assembly. The buyer of this car went with a 6-speed manual set-up and a Tremec T56 transmission is bolted to the block and ready for duty, while the temporary shipping cross member is still in place. A lightweight, drag race only front brake system is in place, as well as a special modified K-member with drop out cross-member and manual rack and pinion steering, but from here everything else is basically a blank canvas. The transmission tunnel has been modified for clearance and use of a one piece drive shaft, while the floor has been raised above the differential for a solid axle conversion. The last one of these we had didnt last long. Dont let it slip through your hands, call today! !